This type of registration would be to help enlist volunteers to serve in your Vacation Bible School. However, this is just a sample. You can use online registrations to enlist all types of volunteers. The goal is to make it easy for your volunteers, as well as for the office staff. Several months prior to VBS, you could email everyone who has worked previously (you can use Search Builder to find them) asking if they will work this year. This is much easier than trying to call everyone. In the email you send out, insert a RegisterLink which will link to an online registration. Be sure to ask questions to find where the person would like to work, do they need childcare, etc. That makes is really easy for the person to sign up and gives you the information you need to place them. Instead of emailing only those who worked previously, you could run a search, for example, for all adult church members who are enrolled in a Life Group and have a Volunteer Application on file. Use whatever criteria you would have for your workers, so that you have, in essence, pre-qualified them for service. 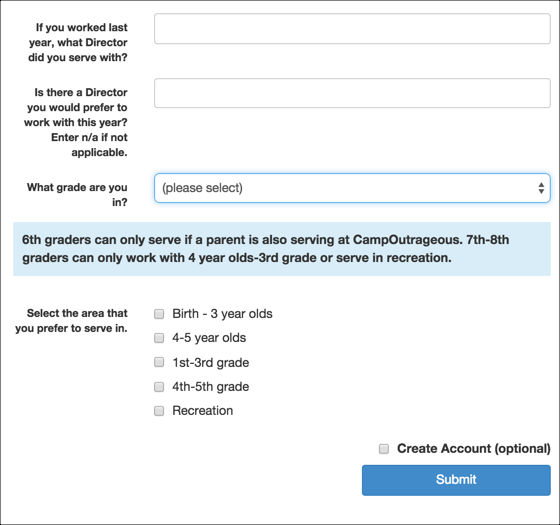 If you want to enlist teenagers to help, create a separate registration for them. Run a search to find eligible candidates based on their age and involvement at the church. Below is a sample of an online registration, with the types of questions you might ask in order to know where to place your volunteers. Notice the use of Headers (the lighter gray text) and Instructions (the slanted text near the bottom). Once you have the workers registered in your VBS Workers organization, it is a simple matter to move them to the specific organization where they will be serving. Manage Org Members is a great tool to help you with this process. We recommend putting teachers and other leaders in the same organization with the children. Example: 1st Grade VBS would have all the 1st grade children as well as the leaders working specifically with 1st grade. You may need other organizations for just leaders. Example: Recreation workers or Refreshment Workers. After the volunteers are assigned to a classroom, be sure to then assign them the appropriate Member Type in the class. This is just a sample to get you thinking. Get creative! Ask the questions that you need to know at your church in order to place your volunteers where they are willing and best-suited to serve. 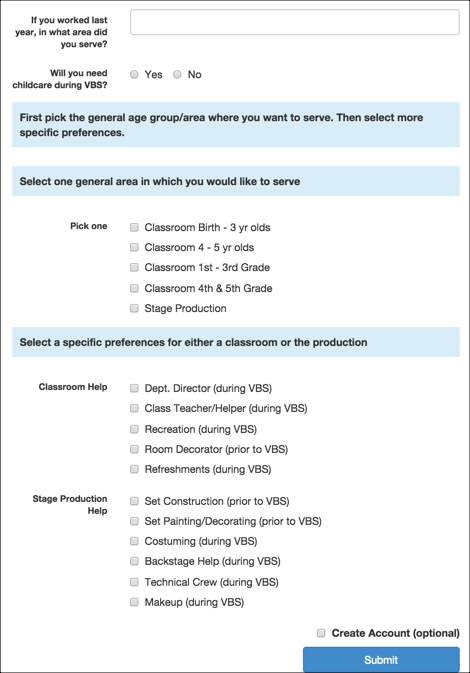 Using Checkboxes or Drop Downs will result in sub-groups getting created, which will be very helpful in evaluating the type of work the volunteer is willing to do. Anything entered in a request field, will display on the Manage Org Members page. That is what is used in the samples below where they are asked to enter text.